Mumbai.Can anybody think that a harmless dialogue Yeh Gujarat Hai can be censored? Yes, the Censor Board wanted to delete this dialogue from a crime thiller film Lateef-The King of Crime, depicting the gruesome world of Gujarat's underworld during 1980s. It looks like Censor Board wants to show too much loyalty to BJP. Expressing his disappointment, producer Kewal Krishna said "We were geared to run promos on TV during the movie release. We approached the censor Board and there was a cut. Then again,we tried again. The absurd order was passed on 23rd July and we received it on July 27, 2014. The film was released on August 1. We did not get chance to run promos, causing loses. What's wrong with dialogues 'Yeh Gujarat Hain and "Lateef maut se nahi darta hai, maut Lateef se darti hai "? The dialogues are part of the movie and censor has no objection over it. The film was passed, why not the promo? We have kept in mind not to hurt to anybody's feelings in the feeling. 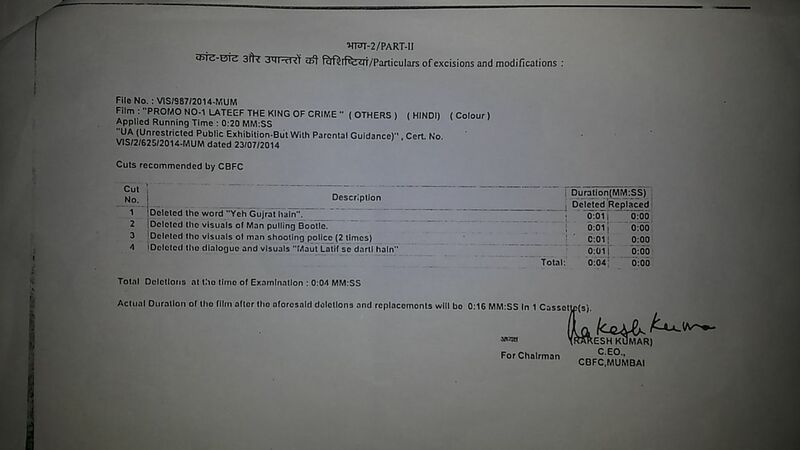 Something is wrong with the Censor Board. Director Sharique Minhaj is equally grieved with decision. He says, Nothing is new. I am fighting them since Chand Bhuj Gaya. Such decisions are very unfortunate and only mirror their narrow mentality.